This unusual Tiffany style lamp is made of the finest creamy white art glass. 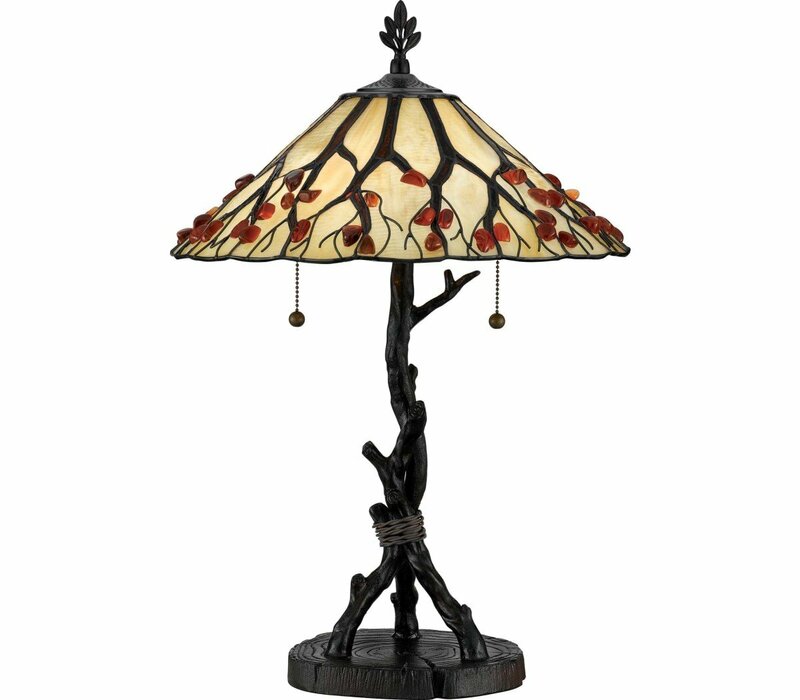 The outstretched branch design on the shade is accented with genuine Agate stones. Each stone is hand selected for quality and size cut in half placed in a tumbler for 72 hours to make smooth and round and is then hand polished to a deep sheen. The branch motif is cleverly echoed in the base. The Quoizel AG711TVA Agate Portable collection Table Lamps in Valiant Bronze use Fluorescent light output and bring Tiffany style. This item is 25"H x 17"W x 17"L. The wattage is 75. The Quoizel Lighting AG711TVA requires 2 bulbs (not included). Additional Information: Shade-Tiffany and Agate Stone Shade; Control-On / Off Switch.